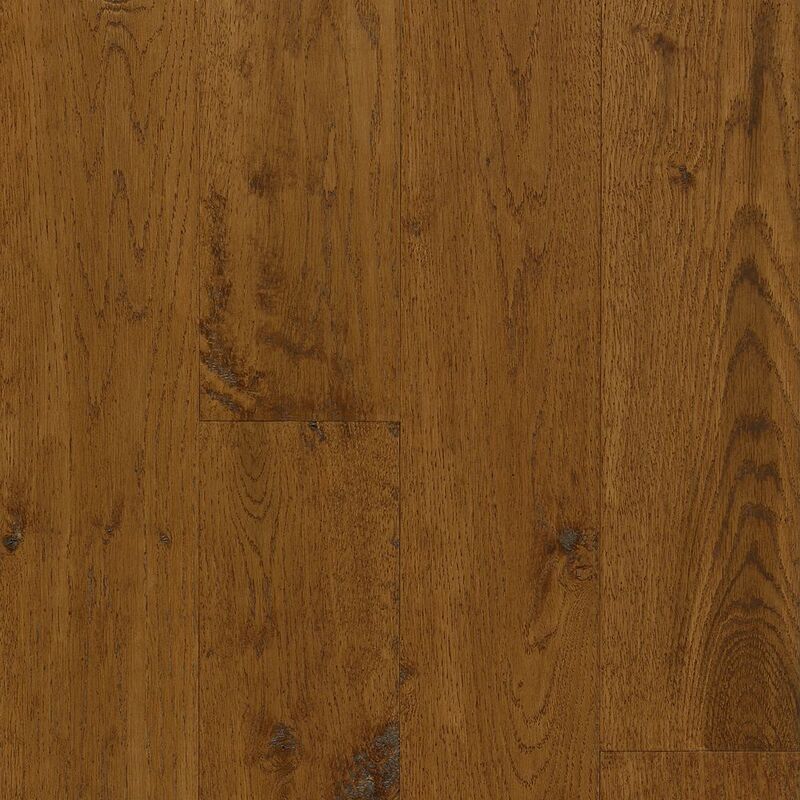 AV Oak Fall Classic 3/8-inch Thick x 5-inch W Engineered Hardwood Flooring (25 sq. ft. / case) is rated 3.4 out of 5 by 9. Rated 1 out of 5 by Diyneighbor from Hardwood and engineered stains drastically differ We happily installed the fall classic hardwood throughout most of our home and have been quite pleased. There were some boards w heavy character. The rustic nature hides some wear and tear. We have a family room built on a slab adjoining our kitchen. We purchased the engineered and hardwood close in time in the same color, fall classic. While some variation in stain and texture is expected from two different products, the stain is NOT at all alike. The engineered is way, way redder in tone, the finish is much shinier, and the grain less noticeable. The hardwood finish is more golden. They look like totally unrelated products. I would not recommend mixing the engineered and hardwood versions at all. They are in adjoining rooms and I regret the choice. They aren't a little off; they look like completely and totally different stains. Rated 4 out of 5 by welsh from A few blemishes were too bad to use and had to be cut out; over all the quality was good. A few blemishes were too bad to use and had to be cut out; over all the quality was good. Rated 2 out of 5 by Troy from The installers found a lot of cracked boards as they... The installers found a lot of cracked boards as they opened them up. I ordered plenty and they ran about 2 boxes short of completing the job because of the culled boards. Unfortunately, they put them in the dumpster and it was hauled away before I knew they ran short. Rated 5 out of 5 by Jim from Easy to work with. Good selection of sizes for... Easy to work with. Good selection of sizes for nice random pattern look. Rated 4 out of 5 by bmwm3 from Very nice product, easy to install. Very nice product, easy to install.